Over the years the World Series of Poker Main Event Final Table members have proved they are no one-trick-ponies, and the 2010 November Nine members have been following their lead. The latest November Niner to make a deep run in a poker tournament is John Racener, who finds himself atop the leader-board of the £5,000 Pot Limit Omaha Championship at the World Series of Poker Europe. The tournament began on Thursday with 120 hopefuls registering for the event; yesterday’s action began with 49 players looking to make the money –the bubble burst with 18 players remaining. Now, with just 15 players remaining it’s still anyone’s game, and Racener is not the only big name still in contention. A look down the leader-board shows Willie Tann (fresh off a final table in Event #1), Felipe Ramos, Jeffrey Lisandro, Jeff Madsen, Chris Bjorin (who also made the final table in Event #1), Day 1 chip-leader Samuel Stein, Joe Serok, and Erik Friberg. The winner of the PLO tournament will walk away with £159,514, not to mention the coveted World Seires of Poker bracelet that will be awarded to the winner, but every remaining player is guaranteed to earn a minimum of £10,104. The 15 remaining players will return today to crown a champion. 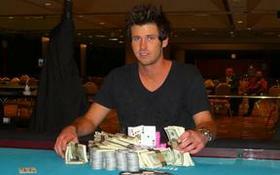 This entry was posted on Saturday, September 18th, 2010 at 4:06 pm and is filed under Poker News. You can follow any responses to this entry through the RSS 2.0 feed. You can leave a response, or trackback from your own site.